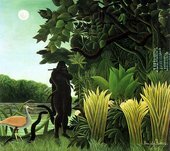 Henri Rousseau (1844–1910) created some of the most popular and memorable paintings of the modern era. This is the first exhibition of his work to be held in the UK for 80 years. Rousseau is celebrated for his visionary jungle paintings which captivate the viewer with the lushness of their plant and animal life painted with incredible detail and precision. Extraordinarily the artist never saw the tropical scenes he brought so much to life, as he never left France. His exotic jungle paintings are the fantasies of a city dweller, constructed from visits to the zoo and botanical gardens, from postcards, books and from Rousseau’s vivid imagination. These jungles have intrigued people for decades, offering a dream of escape from humdrum reality to a savage and yet enchanting realm. Rousseau’s unique vision was celebrated by his modernist contemporaries like Pablo Picasso and the surrealists René Magritte and Max Ernst, who saw his work as opening up new realms of artistic possibility. They were particularly fascinated by his bold, primitive style and the dream-like nature of his paintings. For a customs official who was self-taught and only took up painting full-time in retirement, this was an extraordinary accomplishment. The exhibition features 50 works, most of which have rarely been seen in the UK. It includes an extensive group of jungle paintings, and draws comparisons between these and the artist’s other main areas of artistic interest: Parisian landscapes, portraits and allegorical paintings. Also on display is a comprehensive survey of Rousseau’s source materials, offering a fascinating insight into his working methods and the Paris of his time. Examination of some of Henri Rousseau's key works with background information, discussion points and suggested activities.